Contrary to the grey skies and what sounded like thunder twenty minutes ago, it is summer in London! 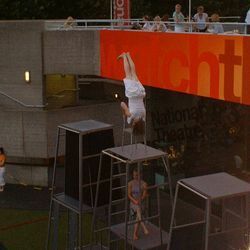 And that means... the National Theatre's annual outdoor free summer festival Watch This Space is back for two and a half months of stuff to enjoy. Last year, we remember seeing the three lissom-limbed, fetching, female acrobats of Mimbre getting rained off their three storey climbing frame (see picture, right), a dragon made out of drums being thumped with ear-splitting glee, spacemen drifting around the astroturf lawn and a very perplexing, season-long wild goose chase after a Rabbit. Charming decanters of free sunscreen were put up on the Watch This Space lawn to keep the overexcited little ones and the fair-skinned grown-ups from burning in last year's searingly hot sun. The organisers may hand out umbrellas instead this year, but it's the thought that counts. This year, Watch This Space kicks off with a Tour de France themed performance from The Bicycle Ballet this Friday, an exploration of life on two wheels from wobbling on stabilisers to the gritty sophistication of urban cycling. Then the season continues with a mixture of live music, live performances and Late Lounge events in the bar on the top floor terrace - late licence drinking by the river is definitely a highlight of the whole season. Rain may stop play, but play on, play on! Watch This Space at the National Theatre, Friday 6 July to mid-September. All events are free; for the full programme, go to the festival website here.